Ballpark Basics: An outdated stadium that might cost the town the team. Ballpark Breakdown: Living in Richmond, we are used to going to see baseball in an outdated stadium (see our review of the Diamond), and just like Richmond, Nashville has been in the middle still unresolved debates about building a new park and where to put it – not to mention who is going to pay for it. The current stadium is about two miles outside of downtown Nashville, and was built on the grounds of Fort Negley (a Civil War fortification) and the surrounding area is mostly industrial. Because of this there is really nothing to do before or after a game in the immediate area. This also does not give the best backdrop for the stadium and there as just some trees beyond the outfield walls. 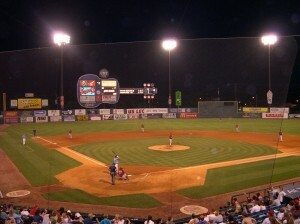 The Nashville Sounds have played here in Herschel Greer Stadium since 1978, which is commonly thought of as the worst period of ballpark construction, and it has gone through numerous small renovations since. The most recent of these being in 2009, after new owners signed on and made additional improvements. It is a fairly nondescript stadium with a ring of box seats that start in right field and goes around the infield. This is separated by an aisle that is considered to be the concourse and above this are bleachers with general admission seating. The only real positive feature – and most distinctive part of the stadium – is the guitar shaped scoreboard where the neck of the guitar contains the game line and the body is covered in advertisements. As stated earlier, local newspapers show that the fight on where to put a new park is eerily similar to the one that played out in Richmond a few years ago; and we are surprised that a Triple A team continues to play at a field like Greer. The new owners have done as much as they can to update the facility, but it is only a matter of time before someone else (a surrounding county or an entirely different city perhaps) pony up for a new ballpark and a major city like Nashville will be without Triple A baseball and most likely any baseball until another team willing to move to Music City reaches a stadium agreement. Brew Basics: Looks like a chain, smells like a chain, but don’t judge this book by its cover. From the menu, décor and website, we went into this Gordon Beirscht lookalike with very low expectations. Chains don’t usually perform to the standards of stand alone local brewing companies, but whether it was the low expectations or being midway through a weekend of drinking, we really enjoyed the brews Big River had to offer. A large building with many different rooms, a variety of tables and booths, all centered around a large, three sided bar. The decor is mostly done in dark wood and shades of green, and is very reminiscent of a (nicer but) typical chain. We were there on a chillier night, and managed to find a spot at the long bar (made out of the same dark wood) which, even on the Sunday night we visited, was surrounded by many stools, loyal locals, and thirsty tourists. There were several busy bartenders who need to be engaged, but were knowledgeable and friendly once you start up a conversation. It’s in a great location right on Broadway, and the outdoor deck is close enough to hear the music streaming from the honky tonks, and t0 allow for excellent people watching in warmer weather. Each of the beers were surprisingly full bodied with unique flavors, and while there were a couple standouts, so many are good that it’s hard to pick just one favorite. We absolutely recommend getting the flite here. Southern Flyer Light Lager – A crisp beer with multiple layers a hint of citrus, and plenty of flavor for a beer – especially considering this is their light offering. Lots of taste, very drinkable with an abv of 3.6% which is just a bit under the typical 4 – 4.2% of common brand light beers. Nashville Steamer Golden Ale – (ABV 4.40%) Another beer with a fairly common American Ale taste – but like the other beers here, not at all watery with distinct flavor and aroma. Smooth without being boring, a solid entry into the Golden Ale category. Sweet Magnolia Brown- Slightly lighter in color than you might expect for a brown ale, but not at all lacking in body. This beer is made from chocolate malts, and has a great bite without being bitter, yummy smoked nut aroma and an ABV of 5.18. Delicious! House Brand India Pale Ale – This dry hopped ale is exactly what you’re hoping to get when you order an IPA, deep gold color, hoppy, with a bitter body that’s slightly chewy. 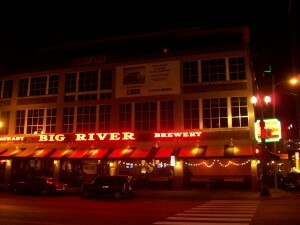 Of course it also has the highest ABV of the traditional Big River beers, 5.9%. Iron Horse Stout (ABV5.65%) Jim loves a stout, and this was no exception. The Iron Horse has a great aroma with a complex coffee and roasted nut flavor. Strong, yet easily drinkable, and one that doesn’t have to be thought of only as a sipping beer to complement your meal. Like the Magnolia Brown, this was a winner of several medals at the World Beer Cup 1998, 2002 and 2004. One of our bartenders recommended trying this with a scoop of ice cream, kind of like a drunken root beer float. Winter’s Nip – Another plus with the flite is that one of the included pours is their current seasonal. The Winter’s Nip is good nut brown color, with strong flavor and very little bite that rounds out with a delicious hop aftertaste. But it was kind of plain for a winter ale, the seasonal spices you would expect were there, but more understated than our favorite winter warmers, Leinenkugel’s Fireside Nut Brown Ale or the Goose Island Christmas Ale.